Stiggy’s Film of the Day Night of the Templar (2012). – Stigmatophilia's gore splattered corner of insanity. Home › Reviews › 00's horror › Stiggy’s Film of the Day Night of the Templar (2012). Today we have a very interesting take on the tried and tested slasher formula, a slasher which manages to successfully straddle two places in history simultaneously. Paul Sampson assembles an impressive cast of some well-known faces, with some newcomers as well, in this gory action/horror/comedy which is steeped in history. 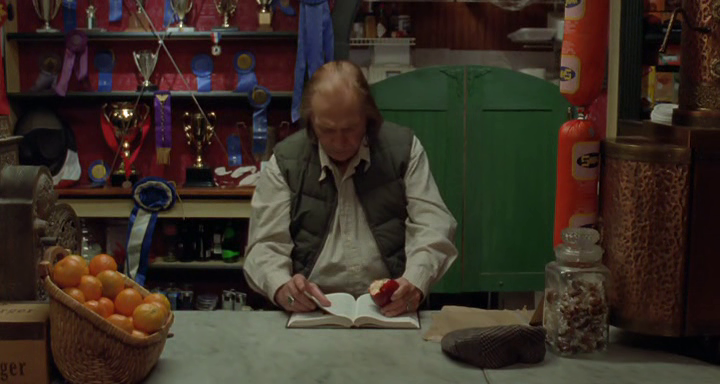 The film took four years to make distribution and sees cult icon David Carradine in a posthumous role, having sadly passed away in 2009 before this film saw its release. The story begins back in The Crusades, with head of the ancient Order of the Knights Templar, Lord Gregoire played by writer, and director Paul Sampson, (who incidentally bears a shocking resemblance to Machine Head Front man Rob Flynn when he appears as the Lord ) being betrayed by his men for a stash of gold they have uncovered. Gregoire swears as he breathes his last breath he will take revenge and promises his betrayers he will return for them after they have had their ’10 lifetimes of excess’. Fast forward and we are back in the present day, with Sampson again playing Jake McCallister an actor who desperate for work has been contracted as an events co-ordinator at an ominous looking castle. The viewers are not given much of an idea as to what he is actually supposed to co-ordinate, but he does not seem to have much of a clue either. As the guests arrive, a strange book containing the legend of the much lamented Lord Gregoire has been left on the coffee table for some light reading, with the guests dipping in and out of the legend contained therein as the story develops. Jake starts having some strange flashbacks, which he initially fights off and the guests all seem a bit confused as to why they have been invited. But there is more to it, as the legend would suggest, and slowly but surely the guests start to get picked off one by one, being killed in various gruesome ways by a strange figure clad in knight’s clothing. Throughout the film we are taken back to the original legend in flashback form to unravel the tale of betrayal and revenge, which is apparently having echoes into the present day, and this lends an extra depth to the story, which I found particularly interesting. In terms of cast despite the relatively modest budget ($3.2 million which is practically blockbuster standard given most of the content we review at The Gore Splattered Corner), we have some seasoned pros on board to help ease things along. 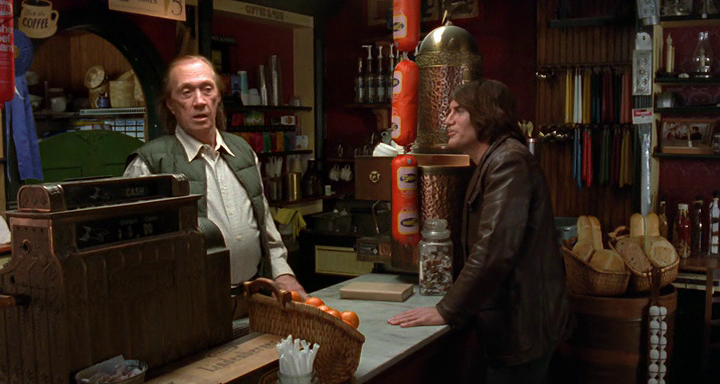 David Carradine as The Shopkeeper plays his part, as expected, with ease. Every line uttered seems to be loaded with some sly sort of in-joke he is having with himself, and it was a pleasure to see him here in one of his later roles. Paul Sampson as the star makes a capable lead, giving it that air of brooding hero type of guy, who very much like Carradine seems loaded up with his own set of deep dark humour. Although the film is tagged as a comedy, the jokes, if you can call them that are a far world apart from the usual splatstick approach you would expect from a slash and hack affair, leaning more on the side of dry witticisms, which works perfectly with the tone of the movie overall. 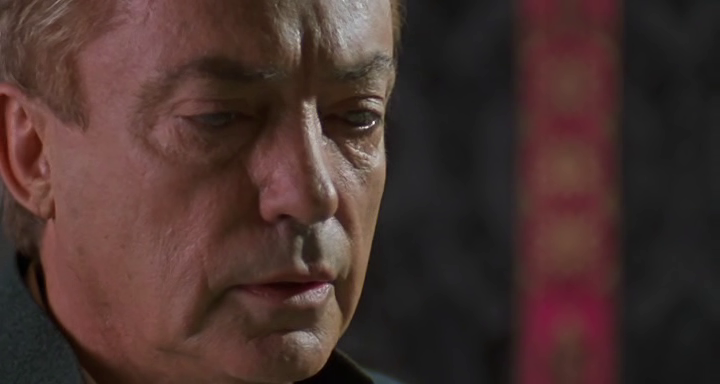 Perhaps my favourite member of the cast was genre mainstay Udo Kier, I don’t know what it is, and I mean this out of the greatest respect, but there is just something deliciously sinister about Udo’s face. 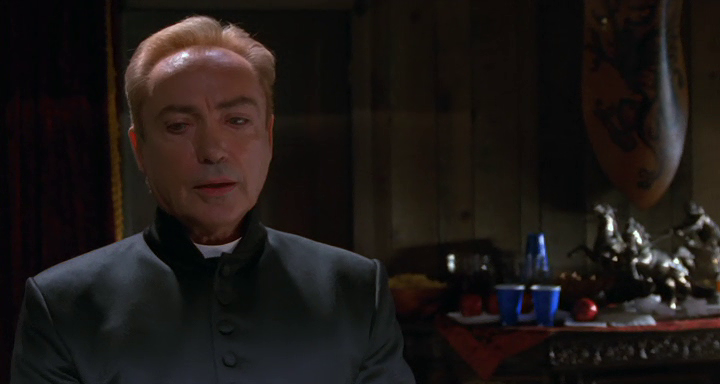 Here he plays a priest, and for me he really made the picture, for some of his ending dialogue and the camp and sleazy way he delivers it. 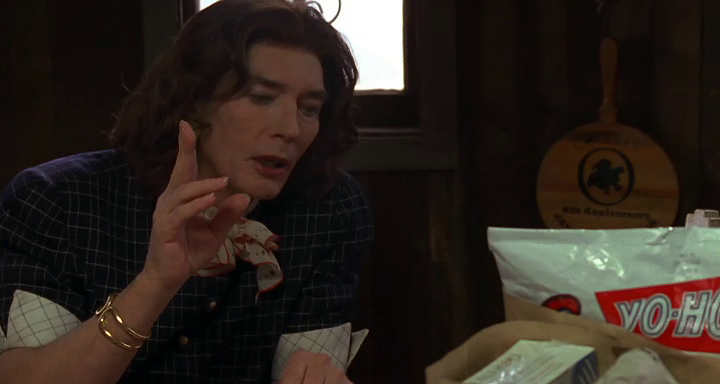 Billy Drago appears rather strangely as a drag queen who works at the castle, just the appearance of him gave the piece an extra element of bizarre and Max Perlich as the equally weirdly clad Benoit the Butler plays a good counterpart to Drago’s more obvious comedic role. There is also a pre Walking Dead part for Norman Reedus, who has since found fame with the aforementioned successful Zombie series, who ramps it up as an oversexed guest. He puts in a solid performance coming off as extremely unlikeable, and somewhat sleazy, as are most of the guests. For the supporting cast of younger players, they do a great job despite lacking the experience of the more veteran cast. Before watching I did check out some of the ratings online and it seems that Night of the Templar’s biggest failing is it has been marketed to the wrong audience. I admit prior to watching I had assumed, seeing the action label, it would be something of a fast paced, fast and furious type affair with things exploding and people firing off guns, nothing could be further from the truth. Many of the online reviewers who marked it low lamented over the lack of budget, and/or action, and this is the problem because of those reviewers none of them appear to be genre fans. For us long time horror fans usually things such as budget do not affect our ability to like, or not like a film, things such as innovative violence, scares, or a strong story line are the factors which will influence our judgement. For your typical slasher, and again this is not typical in any way shape or form, the slick production values on offer here are just the icing on the cake, and certainly above the level of a normal low-budget movie, and the acting standard mirrors this too. The FX, while Night of the Templar is not an overly gory film in comparison to many others, are well done and in keeping with the rest of the film, not coming off as overly digitised, and there are some nice deaths employed, nail gun, strangling, throat slitting, stabbing, and even a sword fight. On balance Night of the Templar did surprise me, it was a strange hybrid of slasher horror, with depth, good performances, and a crisp look, which came completely unexpected. The comedy was dry and to my liking, and plot was absorbing and well developed. I especially liked the historical angle which was well done and did not come off as overly ambitious. I would not say anything involved in the plot twists came as much of a surprise, but then again that did not matter because the characters involved were well fleshed out and interesting. For genre fans I would say check this one out, it is definitely different, and it might just surprise you too. ‹ Author Michael Hibbard talks inspiration: The Lovecraft Effect. Great review, especially the way you described NOTT in terms of style and genre! Thanks Bill! Really enjoyed this one, not what I expected at all! Thanks for the great review. I totally concur with you on it all. Very well written.